Opti-Stack 3000 Vack is a vacuum stacking unit which is able to stack complete or partial layers of workpieces after different main machines such as cross-cut saws, moulding machines, double-end tenoners, resaws and sanding machines. The Opti-Stack 3000 Vack consist of two vacuum heads, suitable for stacking short workpieces from 380 – 2,500 mm (15”- 98”) at a capacity of up to 5 layers per minute by random or uniform lengths. The vacuum head consist of check valves technology which automatically recognizes and closes the valves in areas without workpieces. This ensures lifting of complete layers of random lengths or widths without any adjustments of the vacuum heads. 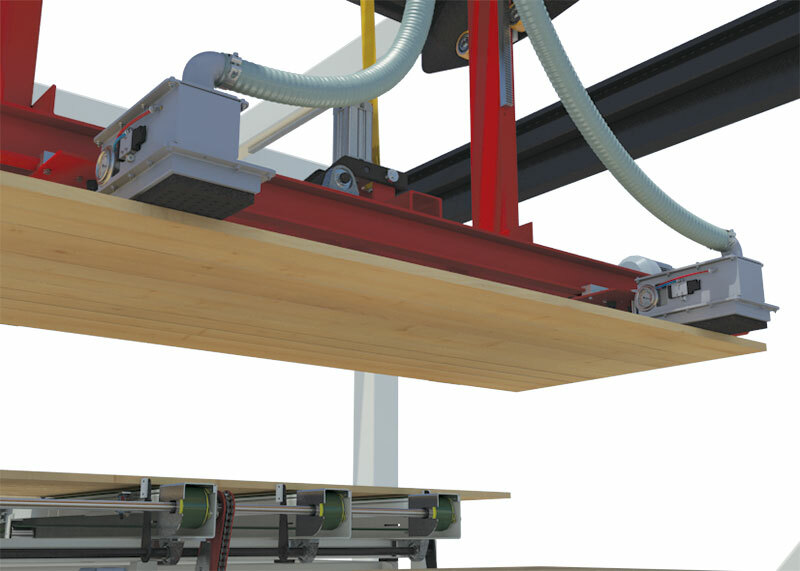 By a modular design the Opti-Stack 3000 Vack stacking unit is suspended from a portal, enabling the stacking of layers to packs standing directly on the floor. Packs can easily and automatically be removed from the floor during operation – without stopping the main machinery. The foam of the vacuum head adjusts to the shape of the workpieces before lifting the layers. This minimizes false air and maximizes the lifting load.